Tomorrow (February 3) there will be written a small note in history about a new marketing channel in Norway. One of Norway’s biggest Theatre Scenes (Oslo Nye Teater) will have a 2 minutes chocolate commercial before the play “The Producers”. This is not a traditional commercial like a film, ad or poster. It will be a short stage play from two of the actors in The Producer, Bartek Kaminski and Jan Martin Johnsen. According to the Director at Oslo Nye, Catrine Telle, this is just a test. But if it works out it might be a new marketing channel and a way for the Theatre to make more money. The 2 minute piece will be introduced to the audience as a commercial so there will be no doubt that this is not a part of the main play. The company behind it is Kraft Foods/Freia and they also consider this as “trying out something new”. The chocolate is a new product from Freia which is launched this week. It will be interesting to see what kind of, if any, reaction this will get from the culture elite and from the audience. 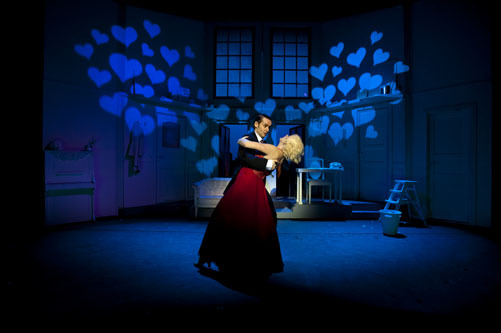 A picture from the play "The Producers"
This entry was posted in Marketing, On the edge and tagged Freia, Marketing channel, Oslo Nye Teater, Performing Arts. Bookmark the permalink.